Continuous positive airway pressure (CPAP) is the gold standard treatment for moderate to severe obstructive sleep apnoea-hypopnoea syndrome (OSAHS) [1-3]. 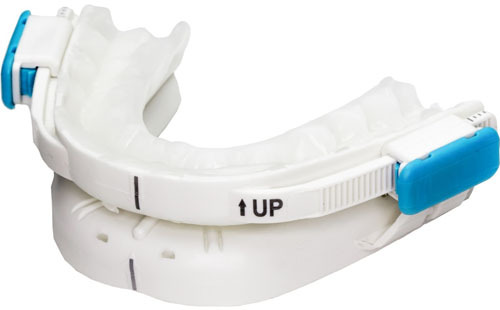 Maintenance of upper airway patency during sleep can also be achieved using a mandibular advancement device (MAD). Prefabricated adjustable thermoplastic MADs (PAT-MADs) are a practical short-term treatment for OSAHS in patients who have failed or refused CPAP therapy [4-7]. Custom-made MADs have been shown to achieve higher rates of improvement and OSAHS cure than prefabricated MADs due to compliance failure with prefabricated devices, mainly caused by insufficient overnight retention [8, 9]. However custom-made devices have the disadvantage of higher cost  and a delay in treatment while the device is manufactured. Each patient was fitted with the PAT-MAD (BluePro®; BlueSom, France; Fig. (1) by their dental practitioner Subsequent PAT-MAD adjustments were made by the patient according to the manufacturer’s instructions until snoring ceased or decreased and there was maximum comfortable advancement. AHI score  for each patient was measured by PSG at inclusion and at the end of the study (EOS). Severity of OSAHS was defined by AHI score as: mild=AHI <15; moderate=AHI 15–29; or severe=AHI ≥30. Successful treatment was defined as a ≥50% reduction in AHI to mild OSAHS, or a reduction in AHI to ≤5/h. ODI score  was also measured at inclusion and EOS by nocturnal oximetry and daytime sleepiness was measured using a patient self-questionnaire and the ESS scale . The new PAT-MAD was effective at reducing respiratory parameters in patients with OSAHS, including three with severe disease, when used for a mean time of 106.3 ± 73.4 days, 5.6 ± 1.7 nights/week and 5.4 ± 1.5 h/night. Mean AHI decreased significantly between inclusion and EOS (from 21.4 ± 7.4 to 9.3 ± 4.1; p<0.0001; mean reduction: 57.0 ± 12.3%) Fig. (2A). Mean ESS also decreased significantly at EOS (from 10.4 ± 2.8 to 7.3 ± 2.3; p=0.0001; mean reduction: 30.3 ± 12.2%) Fig. (2B). A non-significant reduction in mean ODI was observed at EOS (from 7.0 ± 6.9 to 4.7 ± 4.0%; p=0.2; mean reduction: 30.5 ± 25.0%) Fig. (2C). Treatment was considered to have been successful in 22 patients (91.7%) who had mild OSAHS or an AHI score of ≤5 at EOS. A mean of 2 ± 1 advancements were made to the PAT-MAD during treatment. The success rates in this study are compared favourably with the 65% and 68% success rates reported previously with another PAT-MAD [6, 7]. No patient in the current study had problems with device retention confirming previous in vitro results which showed that this PAT-MAD possesses sufficient retention forces to resist initial jaw opening and probably full mouth opening . The device was well tolerated and only mild AEs were reported (mainly dry mouth (37.5%), toothache (37.5%) and TMJ discomfort (16.7%)).